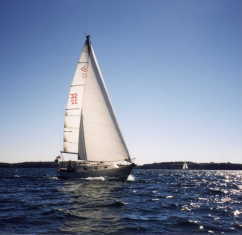 This spring (2001) Chris and Sue plan to bring Titania back from the Chesapeake to Little Sodus Bay in Upstate NY. She's been hauled out for the winter at Fairview Marina in Rock Creek off the Patapsco River, near Baltimore, following a cruise south last fall. They plan to work their way down to the mouth of the Chesapeake and then make a decision whether to come back up on the outside in one or two long passages (2 days! - long for them, anyway) to NY City or go back up inside and through the C & D canal again. Factors may be ocean temperature, winds, time pressures. First thing to do is get down to the boat (with the generous assistance of cousin Bruce), remember everything they need (right! ), and get the boat launched. May 7, 2001 Titania Swims Again!